Management and players from the Kennedy Cup squad receive their new kits from sponsor, Michael Murphy of Michael Murphy Sports and Leisure, Letterkenny. Momentum is gathering as the countdown begins to the Kennedy Cup 2018. The event starts on June 11th in the University of Limerick, and the Donegal 2004 county team have only seven weeks left to finalise their preparations. The Kennedy Cup is a hugely prestigious soccer tournament held annually for elite players at U-14. 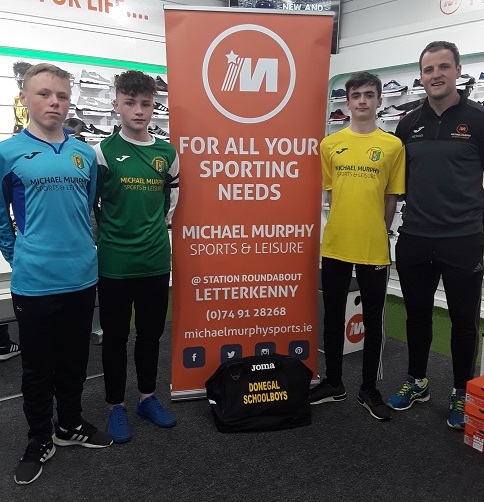 As part of the preparation to represent Donegal at the Kennedy Cup, manager Peter McHugh is delighted to announce that Michael Murphy Sports & Leisure has sponsored the team's new home and away kit. McHugh and his assistant manager Dessie McGlinchey both agree that the new Joma kits will provide a professional look to the team which will match the boys’ own professional approach to the game, their training and preparation and to their conduct both on and off the field. The team management and three of the players attended at the Michael Murphy Sports and Leisure premises at Station Roundabout in Letterkenny to officially accept the new kit. The Donegal 2004 County team captain Luke McGlynn (Cappry Rovers FC) thanked Michael Murphy on behalf of the squad for the new kit. Luke and Ben Campbell (Fintown Harps AFC) proudly modelled the home and away kits while goalkeeper Oran Craig (Dunfanaghy) worse the goalkeeper’s blue jersey. The Donegal 2004 County team will wear the new Michael Murphy Sports and Leisure sponsored kits in the Kennedy Cup and Foyle Cup in July 2018. The management wish to thank Mr Murphy for his support.